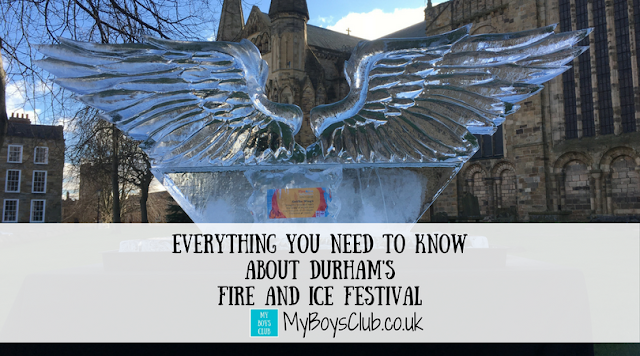 We had a full family day out in Durham today and took in all of the Fire and Ice Festival while we were there. If you missed it today don’t worry, it's back in Durham tomorrow - Saturday 25 February. ‘FIRE and ICE’ is Durham is a stunning and spectacular event sees the City come to life, with an ice sculpture trail lit by flaming beacons weaving its way through the historic streets of Durham. 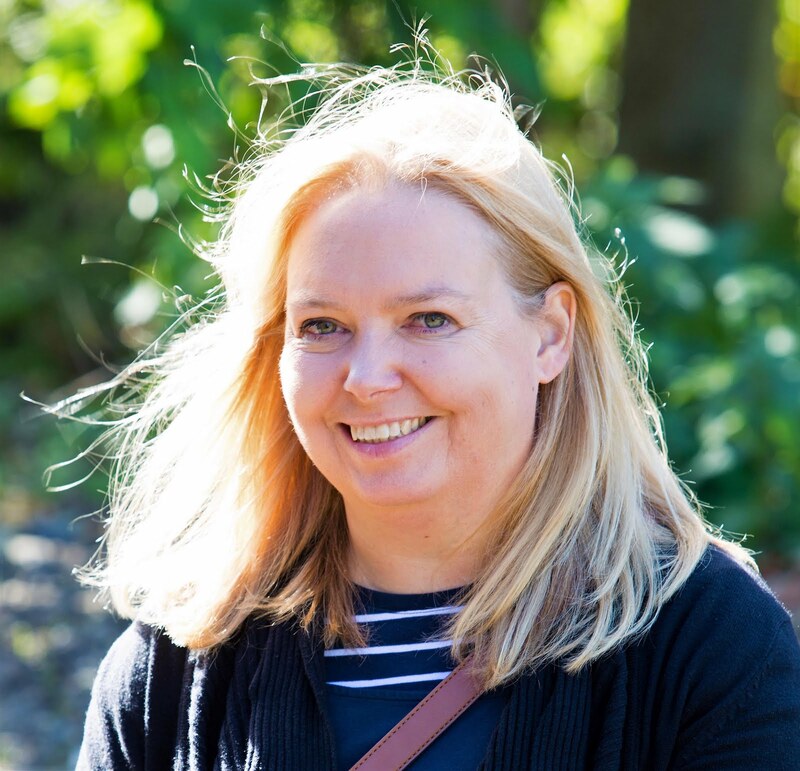 There are plenty of event helpers in Durham handing out trail leaflets but you can download a map of the trail here before you go if you wish. You’ll find sculptures across the city in Millennium Square & the Market Place, on Elvet Bridge & Framwelgate Bridge, at the centre of Prince Bishops shopping centre, also on North Road, Saddler Street, Silver Street, and outside of Durham Cathedral on Palace Green. Just keep an eye out for the flames, and beside them you’ll find King Arthur, a Troll, a Dragon Skull, A Mermaid, the Lambton Worm, Thunderbird, a Sword in the Stone, Frozen Chocolate, a Griffin and frozen chocolate. 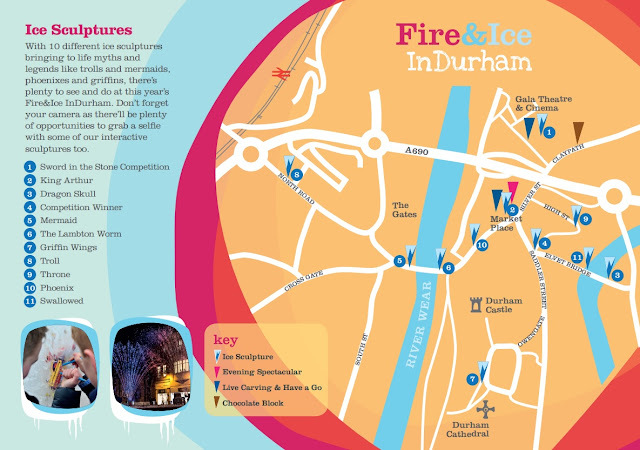 It’s not just any ice that is on show at Fire and Ice in Durham either. 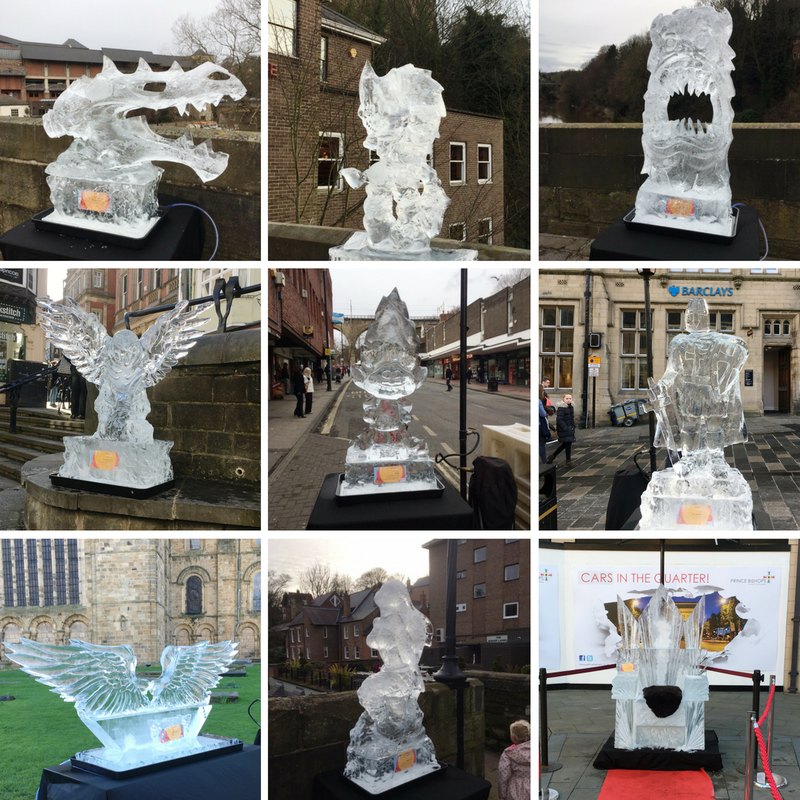 The ice sculptures are being created by Glacial Arts - the creatives behind the ice work in Game of Thrones and you can see their team in action too at the festival. 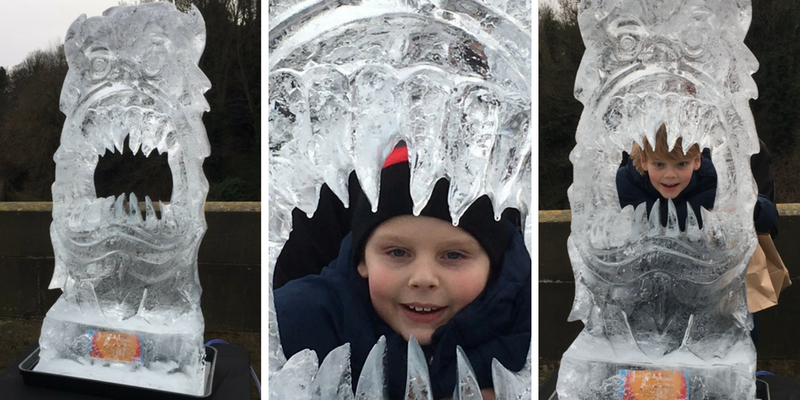 The boys were engrossed and we had to keep going back to see how the ice sculptor was getting on! The demonstrations take place between 1pm & 5pm in the Market Place. You can also get involved too. There are blocks of ice to try out ice-carving yourself. 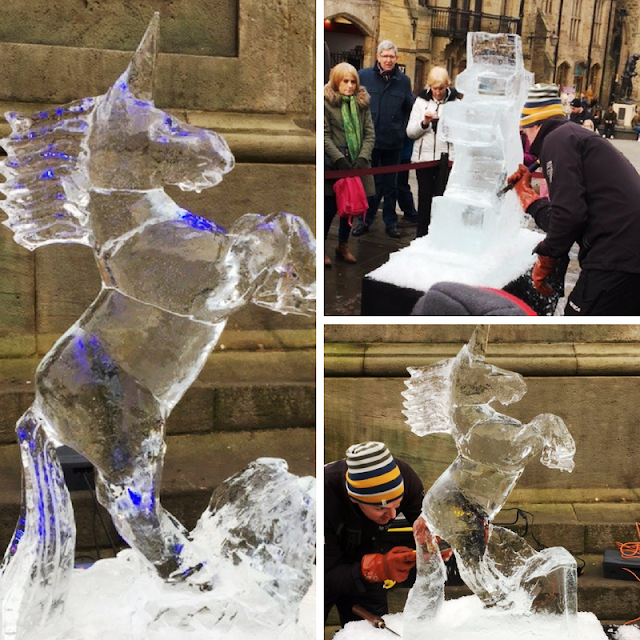 See if you can carve the ice to free the chocolate from the frozen block (between 1pn & 5pm in Millennium Square). Or you can take a selfie being swallowed up, or on the grand throne (Prince Bishops Shopping Centre) or outside of Durham Cathedral with Griffin wings. At the end of the day, don’t miss the grand finale show in the Market Place outside of St Nicholas’ Church, seeing water jets and C02 flames dance in time to a rousing soundtrack, accompanied by an impressive light show. A child-friendly version (picture above) will be performed at 5.15pm lasting approximately 10 minutes, this followed a fire act also in the Market Place which really entertained the crowds too. A second show that is more suitable for adults and older children - as some effects used may be frightening to younger ones - will be performed in the same place at 6.00pm, lasting approximately 15 minutes. We didn’t stay for this show but if it is anything like the rest of day it will be worth waiting for. If you go hope you enjoy it as much as we did.